* Spanish energy company Repsol has signed an agreement with Brittany Ferries to deliver liquefied natural gas (LNG) to its Spanish operations, it said on Friday. * Under the agreement, Repsol will install a fixed quayside LNG storage and supply system in one of Brittany Ferries’ two Spanish ports - Santander or Bilbao. 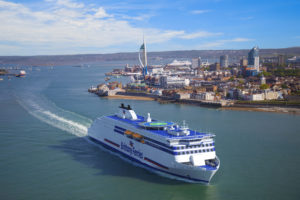 Repsol will then supply LNG bunker fuel to Brittany Ferries’ new LNG-powered cruise ship Salamanca during the ship’s routes between Britain and Spain. * The supply of LNG will begin in 2022 after Salamanca's entry into service. It will be Britrany Ferries' second LNG-powered ship.